Growing up in suburban New Jersey, Hudson Taylor was not one of the ‘cool’ kids. In sixth grade, he enjoyed taking ballet, despite putting up with jokes about wearing a leotard. And in a town where soccer was the ‘in’ sport, he preferred wrestling. But what was very cool about Hudson was his unwavering determination to follow his own path, not someone else’s. That attitude served Hudson well. During high school and college, he performed in the choir and in theatre and he continued to excel in the sport he loved. And while he became a top-ranked, All-American, champion wrestler, his teammates used homophobic insults to degrade his decision to join choir and theatre. In college that reality really hit home. Hudson remembers a student in his theatre class standing up and proudly announcing that he was gay. At that moment Hudson says he understood that something had to be done to make the athletic community as welcoming to LGBTQ people as his theatre community. He began small, adding an LGBTQ equality sticker to his wrestling headgear. The move earned him positive media attention, and an avalanche of emails from closeted athletes, sharing their own experiences. With graduation on the horizon, Hudson made an unusual decision. In addition to coaching, he would become an activist on behalf of the LGBTQ community, particularly in the arena of sports. Why was that so unusual? Not just because Hudson is a straight man. There is also his family. Hudson was raised in a stalwart Evangelical Christian family. His Great Grandfather, James Hudson Taylor, was one of the first missionaries to China, and both his mother and his sister attended Bible College. So Hudson’s plans were a challenge. To his family’s credit, they never discouraged him from the commitment he had made to himself and the LGBTQ community. After years of competing in sports, it was clear to Hudson that systemic homophobia and transphobia had isolated LGBTQ athletes and coaches and made many afraid to come out. To help change the athletic culture, in 2011 Hudson launched Athlete Ally with a mission of fostering inclusive sports communities through public awareness campaigns, educational programs and political action. Among its current petitions, Athlete Ally is asking the NCAA not to award championship tournaments to states that are not inclusive. And, recently, it published an open letter calling on World Rugby to abandon its policies that deter transgender athletes from competing. “Sports should be a place where everyone can be themselves,” says Hudson. Six years in, Hudson says two of the biggest obstacles to achieving that goal are conformity and awareness. Add to that, Hudson says, is the fact that he, like many athletes, never thought he had a guy on his team or in his social circle who was gay and that creates a lack of awareness. Hudson visits 30 colleges a year to work with administrators, coaches and sports programs. He says even in the most progressive places, it’s the first time the discussion has been had in sports. And the numbers are encouraging. Hudson says in 1990, the average age of people coming out was 26. Now it is 14. Athlete Ally believes that anyone who touches sports should be educated about respecting the LGBTQ community on the field and in society as a whole. 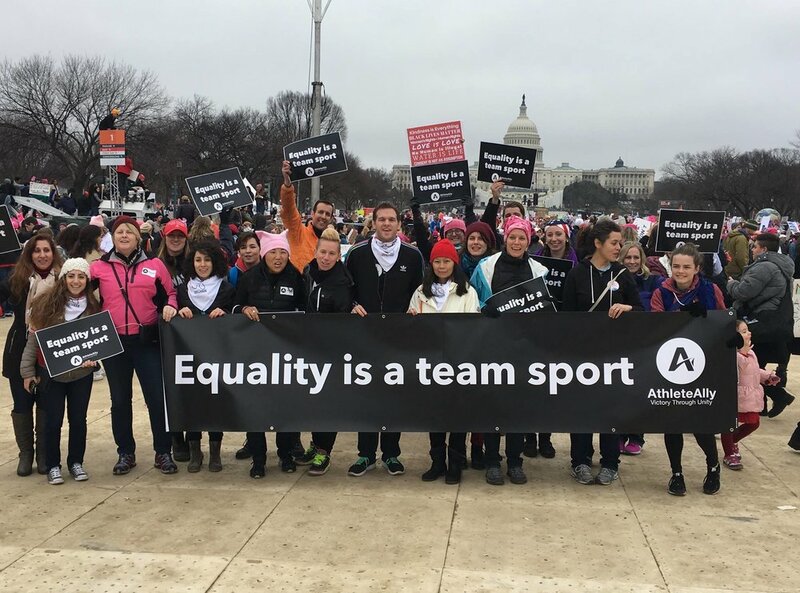 Athlete Ally community at the 2017 Women’s March in Washington D.C.
And he believes that athletes play a major role in achieving that because the love of sports and adulation of sports figures is universal. That’s why his vision includes spreading his message globally and developing allies in places where being LGBTQ is punishable by fines, arrest or death. Hudson was a three-time NCAA All-American and two-time NCAA Academic All-American wrestler who racked up the most pins; most wins in the history of the University of Maryland. He is ranked among the top five pinners in NCAA wrestling history and holds several hall-of-fame records. After graduating from the University of Maryland, Hudson became a wrestling coach at Columbia University in New York. He also has a blog on HuffPost. His newest passion is teaching Jiu-jitsu.